full of memories with our amazing props! Take the action outside the booth with our selfie pod hire in London, Essex, Kent & the South East of England. Our stand alone pods are the perfect addition for huge group photos at any event. Our brand new selfie compact pod hire is perfect for memorable wedding photos & corporate brand recognition, as well as general party entertainment. Complete with a huge prop box our selfie pods allow guests to take away their instant dry print outs within seconds. Our Pod at your event. 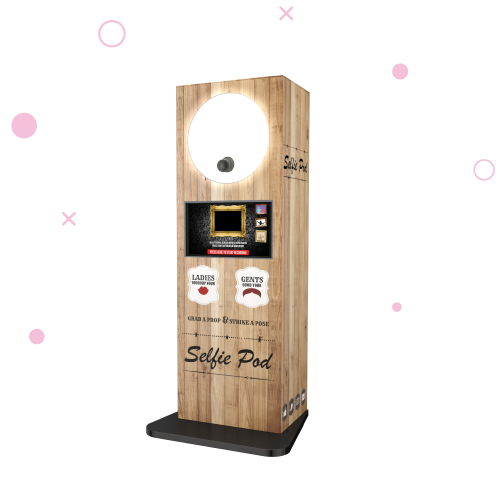 Our selfie pod rental sits perfectly at any venue, shop or office. Its the fun of a photo booth but brought outside for the world to see. The use of a selfie pod attracts its own attention making a selfie pod an ever popular choice for get-togethers! We can fully brand the pod to have corporate wrapping or we can bring along our standard pattern of vintage wood. Whatever your needs for our selfie pod, we can help so, don’t hesitate to pick up the phone and ask one of the friendly OMG! team how you can have one of the most popular crazes at your event! To find out more information about our open air photo booths, contact the OMG! Team on 0800 234 3447 or send us an enquiry using the form below!